Today we have a great interview with Jim Wendler of Elite Fitness System. He will be sharing with you what he knows about posterior chain training and how it will make you faster. Check it out. "The Posterior Chain" is a common training term in athletic development. Jim Wendler, a powerlifter and strength coach from Elite Fitness Systems (EFS) explains how everyone can benefit by training the chain. [ CBathletics.com ] Jim, tell us about yourself and EFS. Our entire inventory has been tested and endorsed by world-renowned strength coaches, as well as some of America's top athletes. I have been part of Elite Fitness Systems for almost 2 years and have been recently hired full-time. I have been weight training since I was 13-years old with an emphasis on improving sports performance. After high school, I briefly attended the U.S. Air Force Academy and transferred to the University of Arizona. At Arizona, I played football and continued weight training. After graduating, I moved to Kentucky, where I served as a graduate assistant strength coach. [ CB ] Great stuff. Jim, what's "The Posterior Chain"? 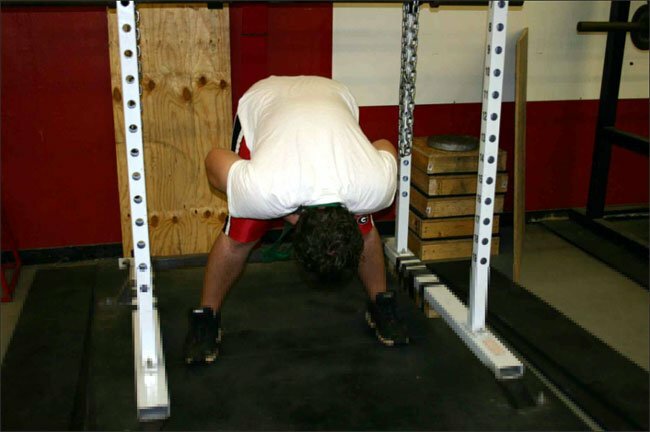 Why is it so important for athletes, powerlifters, and even the average person?
! Also, it's a great way to reduce injury because the hamstrings and low back are an oft-injured area on athletes. 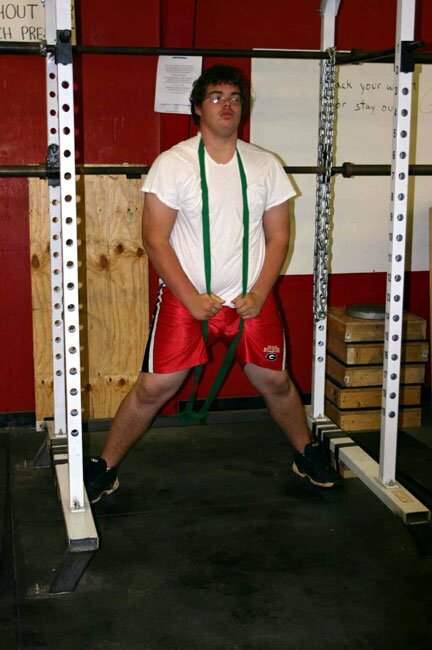 For powerlifters, the "p-chain" is the key to a big squat and deadlift as well as offering injury prevention. I have yet to see a big squatter without an incredibly strong lower back. For the everyday person, the p-chain is incredibly important for quality of life. I can't tell you the amount of people I've trained that have improved day-to-day activities with a simple regimen of low back, abdominal, glute and hamstring exercises. Most people only want to train what they see in the mirror and focus too much on the front of their bodies. [ CB ] Can training the posterior chain even help a bodybuilder?
? Well, yes, I guess for the aesthetic appeal and injury prevention. To sum up, everyone can benefit from extra work on their posterior chain and abdominal region. This is often the most neglected part of anyone's body. [ CB ] Do you have any specific performance numbers you can give us about the posterior chain? For example, if an athlete improves their squat by 25%, could they expect to see a 5, 10, or 25% increase in vertical jump or a 0.2 second reduction in 40-yard dash time? is so dependent on technique during the start and the first 10 yards. I guarantee that if you master the first part of a 40, you will shave a few tenths off of your previous best. The vertical jump also has plenty of tricks that can allow you to jump a few inches higher. Martin Rooney at the Parisi Speed School is the king of preparing athletes. But if you combine this knowledge with a strong posterior chain, you give yourself the best chance at posting good numbers. [ CB ] Martin Rooney was interviewed in Issue #107 and he gave some great athletic development tips. In your opinion, how should someone train to improve their posterior chain? workout. These four exercises don't need to be ballbusters. For example, start with back raises, some kind of abdominal exercise, glute-ham raises and bodyweight lunges. You will be surprised at how quickly this will help an athlete or the everyday person. Dragging a weighted sled is also a great way to improve their posterior chain and can be done as a warm-up. [ CB ] Where do you insert posterior chain training workouts into a weekly schedule?
. I will always do some kind of abdominal work. [ CB ] Where does the average person start? I should probably say that form is paramount. Don't be that guy that looks like a fish out of water when exercising. Learn the proper form on the deadlift, and learn how to squat on a box and be patient. [ CB ] Where should an untrained, young female athlete start? Again, bodyweight exercises and proper form. I will say this: every strength coach wants to argue on which training method is best, why you should use a wobble board, why you shouldn't squat or throw some nonsense that is backed up by a study done in a small village in Thailand. If these strength coaches would just have their athletes use good form on their lifts, 99% of the problems would be solved. It's absolutely unbelievable how many coaches let their athletes lift with poor form. If you take any untrained athlete, you have a blank canvas with which to work. Hopefully, the coach will take full advantage of this and teach them correctly. [ CB ] Jim, does an athlete's training program need Olympic lifts? What role do dynamic squats have in acquiring power? Are the two methods interchangeable? (are they doing it for the triple extension, just to rack the weight, or to become great power cleaners?) are some of the biggest drawbacks in performing Olympic lifts. Any lift can be performed explosively. The great thing about box squats done using the dynamic effort method is that they are easy to teach and also very effective. There are many coaches who believe that a program cannot work unless "X" is present. What a bunch of B.S. - any program will work provided that the coach believes in it, the athletes believe in it, and there is a great attitude present in the training facility. Those that have trained "wrong" have often made great gains simply because they had a killer attitude. [ CB ] What advice do you have for a guy that wants to do dynamic squats but isn't allowed to use chains or bands at his gym? For many years, Westside Barbell did not use chains or bands and still had great success. If you feel like you can't squat big because you don't have chains and/or bands, then you are just finding excuses for your pathetic squat. [ CB ] And finally, give us the straight goods on getting big. What do you say to a guy when he comes to you with that goal? Seriously, when someone wants to get big, it comes down to 3 things; eating, being consistent in the weight room, and patience. In America, everyone is so damn impatient and few people want to put in the time to be successful. And these are the people that call themselves "hardgainers". What a joke. Putting a label on yourself that already defines you as a failure is an easy way of admitting defeat and thus having an acceptable excuse. A friend of mine, J.L. Holdsworth, always says, "Those that say they can't gain weight should just say 'I'm not dedicated enough to gain weight.'" Lifting, getting big, being successful, and basically any situation in life - it all comes down to attitude. If you aren't willing to put in the work and the time and the sacrifice, then stop complaining and find a new sport. This information courtesy of cbathletics.com is for educational purposes only. It is not medical advice nor is it intended to replace the advice or attention of health-care professionals. Consult your physician before beginning or making changes in your diet or exercise program, for diagnosis and treatment of illness and injuries, and for advice regarding medications.